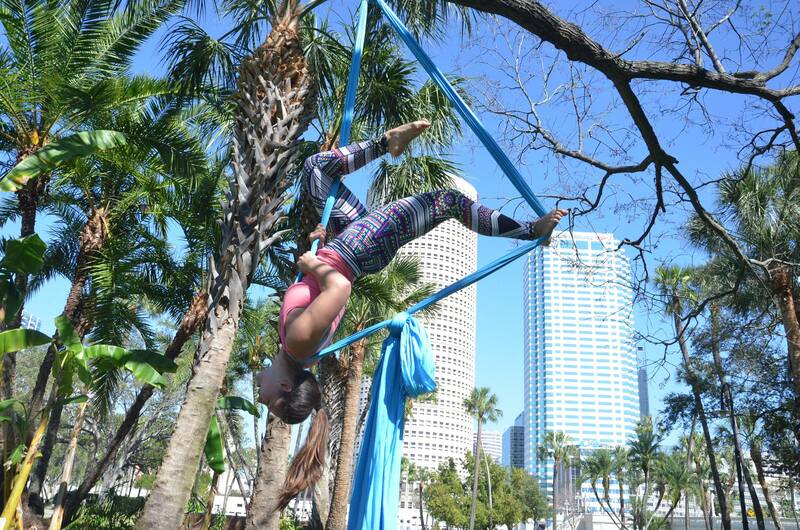 Tossing a piece of rope over a tree in Plant Park, Kylie Lowell, a junior digital arts major at the University of Tampa, laughed at what she called her recent lack of strength. It had been a while, Lowell said, since she took the long blue silk outside. Aerial silks made their grand television debut in 2010 when pop singer P!nk performed for the Grammy awards mid-air, hanging from fabrics. The silks are also common in Cirque du Soleil and similar productions, with performers twisting and spinning themselves, creating a visually appealing aesthetic. For Lowell, however, aerial silks is less of a routined performance and more of an exercise. From the age of two, Lowell participated in gymnastics. She eventually began competing. With her mother as her coach and her family owning a gym, the sport was a large part of Lowell’s life. “I was never really that great at it for how long I did it, but it was fun,” Lowell said. Although Lowell sticks to her gymnastics roots by practicing with the UT Gymnastics Club weekly, she stopped competing when she graduated from high school. As Lowell wrapped herself into the fabric to begin her workout, a small audience began to form. Four students stopped, standing or sitting in the grass, to watch Lowell show off her skills. Damian Wehrle, a junior economics major, was inspired by Lowell’s workout and asked her to show him a trick or two. Lowell demonstrated a few moves, one by sitting on the silks as you would a swing, then she turned her body until she was straddling the silks, then she placed her feet in front and pushed against the silks, extending her body until it was essentially flattened. Wehrle was a quick study. Lowell was able to order her silks online for approximately $100, but there are also studios in the area where people can try their hand. Lowell also likes to work out occasionally in the school’s gym, but she has a personal fitness pole that she climbs to keep toned. Lowell said she encounters some issues when using her silks, like getting yelled at by campus safety and faculty for being in the trees, but the greatest deterrent is her schedule.